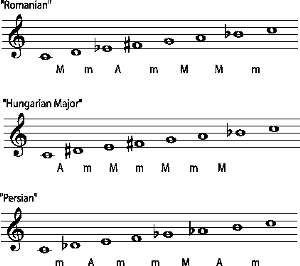 Modern Western music uses major and minor scales. 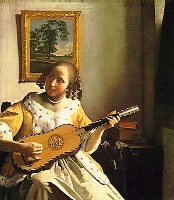 Scales from other traditions include the pentatonic scale, blues scale, and the medieval church modes. One of the things that makes music pleasant to hear and easy to "understand" is that only a few of all the possible pitches are used. But not all pieces of music use the same set of pitches. In order to be familiar with the particular notes that a piece of music might use, musicians study scales. The set of pitches that a piece of music uses can be arranged into a scale. In a scale, the pitches are usually arranged from lowest to highest (or highest to lowest), in a pattern that usually repeats within every octave. The set of pitches, or notes, that are used, and their relationships to each other, makes a big impact on how the music sounds. For example, for centuries, most Western music has been based on major and minor scales. That is one of the things that makes it instantly recognizable as Western music. Much of the music of eastern Asia, on the other hand, was for many centuries based on a pentatonic scale, giving it a much different flavour that is also easy to recognize. Pentatonic scales are often associated with eastern Asia, but many other music traditions also use them. Blues scales, used in blues, jazz, and other African-American traditions, grew out of a compromise between European and African scales. Some of the scales that sound "exotic" to the Western ear are taken from the musical traditions of eastern Europe, the Middle East, and western Asia. Microtones can be found in some traditional musics (for example, Indian classical music) and in some modern art music. Note: Some music traditions, such as Indian and medieval European, use modes or ragas, which are not quite the same as scales. Please see Modes and Ragas. In the chromatic scale, all intervals are a half step. This scale gives all the sharp, flat, and natural notes commonly used in all Western music, and this is also the twelve-tone scale used by twentieth-century composers to create their atonal music. Young instrumentalists are encourages to practice playing the chromatic scale in order to ensure that they know the fingerings for all the notes. 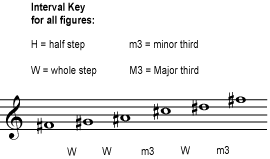 In a whole tone scale, all the intervals are a whole step. In both the chromatic and the whole tone scales, all the intervals are the same. This results in scales that have no tonal center; no note feels more or less important than the others. Because of this, most traditional and popular Western music uses major or minor scales rather than the chromatic or whole tone scales. But composers who don't want their music to have a tonal centre (for example, many composers of "modern classical" music) often use these scales. In a pentatonic scale, only five of the possible pitches within an octave are used. (So the scale will repeat starting at the sixth tone.) The most familiar pentatonic scales are used in much of the music of eastern Asia. You may be familiar with the scale below as the scale that is produced when you play all the "black keys" on a piano keyboard. Like other scales, this pentatonic scale is transposable: you can move the entire scale up or down by a half step or a major third or any interval you like. The scale will sound higher or lower, but other than that it will sound the same, because the pattern of intervals between the notes (half steps, whole steps, and minor thirds) is the same. But this is not the only possible type of pentatonic scale. Any scale that uses only five notes within one octave is a pentatonic scale. The following pentatonic scale, for example, is not simply another transposition of the "black key" pentatonic scale; the pattern of intervals between the notes is different. The point here is that music based on the first pentatonic scale given will sound very different from music based on this pentatonic scale because the relationships between the notes are different. (Much as music in a minor key is noticeably different from music in a major key.) But music in the scales that are simply transpositions of each other will sound no different than music in, for example A major or C major. So there are quite a few different possible pentatonic scales that will produce a recognizably "unique sound". Any scale will list a certain number of notes within an octave. For major and minor scales, there are seven notes; for pentatonic, five; for a chromatic scale, twelve. Although some divisions are more common than others, any division can be imagined, and many are used in different musical traditions around the world. For example, the classical music of India recognizes twenty-two different possible pitches within an octave; each raga uses five, six, or seven of these possible pitches. And there are some traditions in Africa that use six (hexatonic scale) or eight notes (octatonic scale) within an octave. Many Non-Western traditions, besides using different scales, also use different tuning systems; the intervals in the scales may involve quarter tones (a half of a half step), for example, or other intervals we don't use. Even trying to write them in standard notation can be a bit misleading. 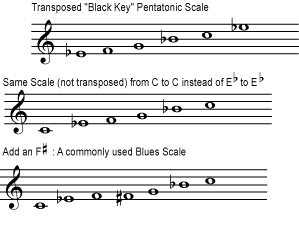 Blues scales are closely related to pentatonic scales. (Some versions are pentatonic.) Rearrange the pentatonic scale in figure 4 above so that it begins on the C, and add an F sharp in between the F and G, and you have a commonly used version of the blues scale. There are many other scales that are not part of the major-minor system; these are often called exotic scales. Some, like pentatonic and octatonic scales, have fewer or more notes per octave, but many have seven tones, just as a major scale does. Some, like the whole tone scale, are invented by composers exploring new ideas; some, with names such as "Persian" and "Hungarian", are based on the music of other cultures. These may be borrowed from music that is essentially modal, but used as a scale in jazz and "world" music. If you want to compose or improvise music, you can experiment with making up new scales, unusual combinations of notes to be used in your music. Here are just a few examples of the many possibilities: symmetrical scale, enigmatic scale, Arabian Scale, and Hungarian Major Scale.